I think one of my favorite summertime flavors is s’mores. There is something so comforting about melting marshmallows between chocolate and graham crackers. Fold in finely chopped chocolate. Prepare graham cracker crust. Add melted butter to graham crackers and combine until moistened. Spread about 1 tablespoon of crumbs into bottom of cupcake liner. Press down flat. Pour the batter (a heaping tablespoon) into the prepared cupcake pans and bake for 18-20 minutes at 350, until a cake tester comes out clean. On a parchment lined cookie sheet, set out 6 marshmallows. (You will be working in batches of six) Place under broiler for about 1-2 minutes, or until marshmallow starts to turn brown and deflate. Remove from oven and (being careful not to touch pan!) 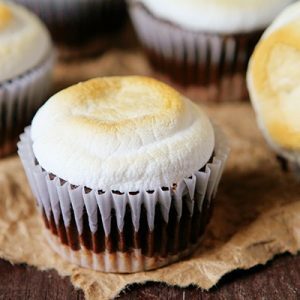 slide a spatula under the marshmallow and set on cupcake.